A few years after her dad passed away, Ashley Ayala discovered a way she could be at peace one hour at a time. The Dubuque woman felt at home when she practiced yoga at a studio while attending the University of Iowa. It wasn’t long before Ayala started dreaming of one day opening a yoga studio of her own. 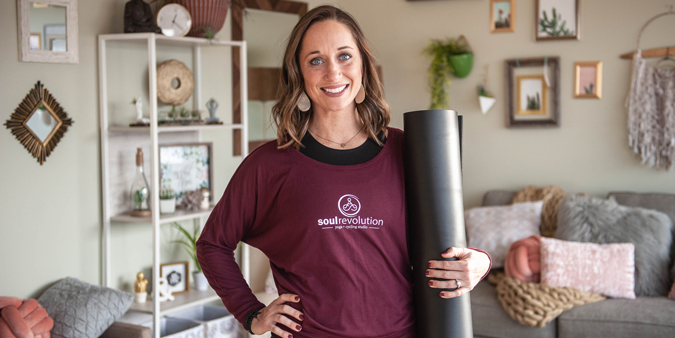 That dream came to fruition at the end of 2018, when she and her husband, Ricky, opened Soul Revolution Yoga + Cycling Studio at Dubuque’s Wacker Plaza. It was the culmination of years of dreaming, months of planning and countless discussions with Dupaco’s business lending department, which loaned her the startup funds she needed. Ayala’s unique studio combines the benefits of yoga with the cardio benefits of cycling. The studio focuses on building community and practicing balance and authenticity. Ayala knew she would turn to Dupaco to help launch her business. The credit union had been there for her before, helping her understand and build her credit—and, along the way, build confidence in herself. Ayala began working with Dupaco’s Chad Breitsprecker last year. From the beginning, it was about much more than a business loan, she said. Breitsprecker coached her on opening the business, answered all of her questions and gave her the financial boost she needed to take the next steps. There are many days when Ayala can’t believe her studio has opened its doors.